Sort by Date in Excel (Examples) | How to Sort by Date in Excel? 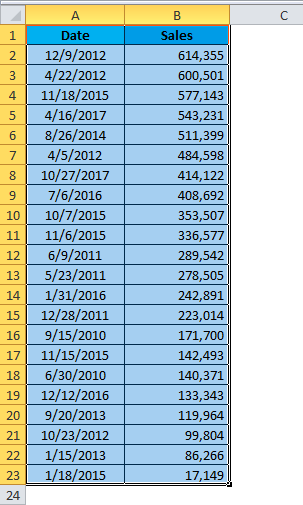 How to Sort by Dates in Excel? 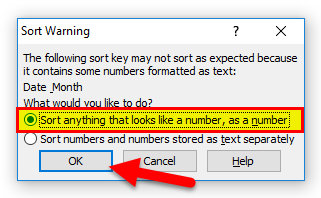 Some of the quite used options in excel is Sorting. Sorting is the process of arranging things in order with pre-determined criteria’s. 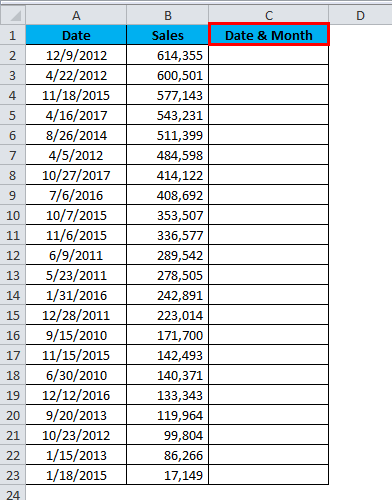 In this article, we will sort dates from oldest to newest and newest to oldest and I will also show you the process of sorting dates in excel. When we work with dates in sales reports we may require to sort the sales data date wise. 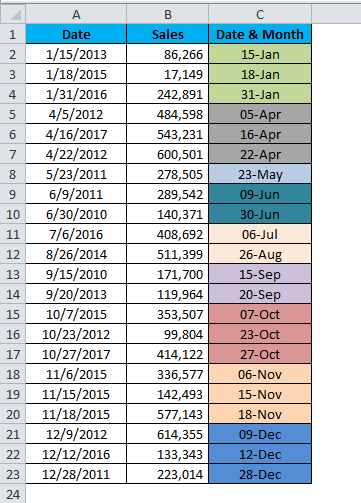 Excel sorting date is as easy as you like. Follow this article to learn the process and master it. Where to find Sort Option in Excel? 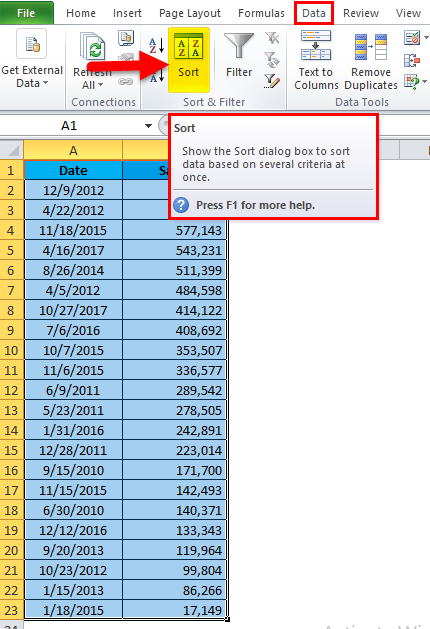 In excel sort option is available under Data tab. 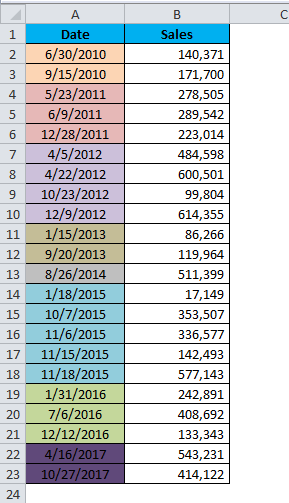 If you want to sort dates in excel we can use either from oldest to newest or newest to oldest. Oldest to Newest: This will bring the old dates first and push the latest dates to the bottom. Newest to Oldest: This will bring the latest dates to the top and push the old dates to the bottom of the data. Based on the user requirement we can select any one of the above options. It is very simple and easy. 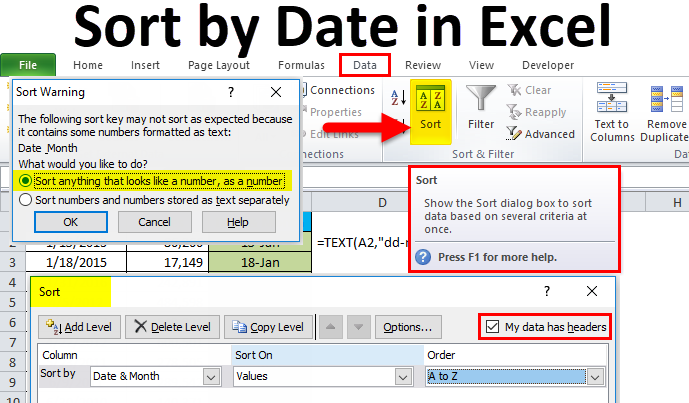 Let us understand the working of excel sort by date with some examples. Look at the below data. I have sales numbers from the year 2012 to 2017. Sales are made across dates in these years. 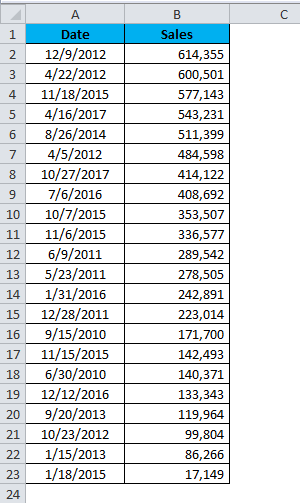 Now I want to sort the excel data from old dates to new dates. Follow the below steps to unleash this option. Select the entire data set. If you are sorting dates, it does not mean you need to select only the date column but you need to select the entire data set. If you are selecting only the dates column data will be interchanged. In this example, I am selecting the data from A1 to B23. Sort option is available under the Data tab. Once you click on Sort option it will open the below dialogue box. Before selecting the Sort by option make sure the My data has headers checkbox is ticked. This will make the first row of the data selection as headers. Now click on the drop-down list of Sort by. Here you will see two headers of the selection, select Date option. Under the order section, select the way you want to sort the data. In this example, I am selecting as Oldest to Newest. Once all the options are selected click on the Ok button. It will sort all the data based on the dates from Oldest to Newest. Each color represents each year dates. It has sorted the data from 30th June 2010 to the latest date of 27th Oct 2017. Take the same data from the above example for this example as well. The above example has sorted the data from DD-MM-YYYY format. But here we will do different sorting. I want to sort the data based on the date and month. For example June month all together irrespective of the year. Insert one helper column called Date & Month. Apply TEXT formula as shown in the below image. 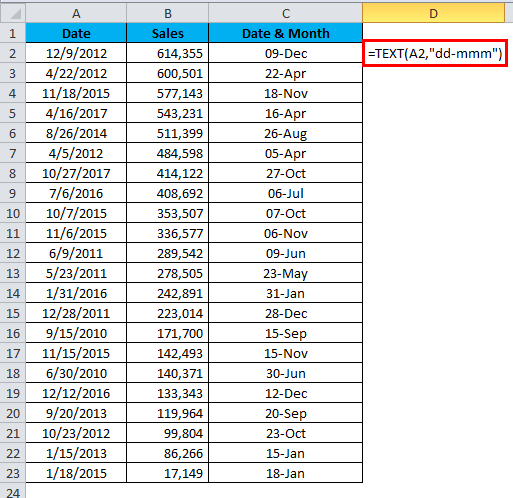 TEXT formula ignores the year part and returns only the Date and month name. DD – This will represent day from the date. MM – This will return month in numbers. For example, for June it will return 06. MMM – This will return month in Text with 3 characters. For September it will return Sep. Select the entire data including the newly inserted column and press the shortcut key to open the sort option. (I am leaving the shortcut key to you because I have already mentioned the shortcut key in the previous example). From the drop-down select the newly inserted column Date & Month. Now look the Order section. It is not showing date formatting of Oldest to Newest or Newest to Oldest. It is showing as A to Z. Because the newly inserted row is not in the date format rather it is in text format. Select A to Z. If you click on OK it will sort instantly rather it will open up the one more dialogue box. Select below option from that dialogue box and then click Ok. It will sort the data based on the criteria we have given. Now, look at the above image it has sorted based on the date and the month irrespective of the year. It has put all Jan together, all Feb together and so on. It is important to select My data has headers. You can create your custom list as well. The custom list includes your order. We sort text, numbers, and dates. To sort dates, dates column should be formatted as a date.